Fairgrounds only host festivals once or twice a year, but they also offer a huge boost to trade in an area. A Great Market significantly boosts trade - almost anything can be found among its stalls and shops. A Merchants' Quarter boosts trade thanks to the numbers of townsfolk now involved in business of all kinds. 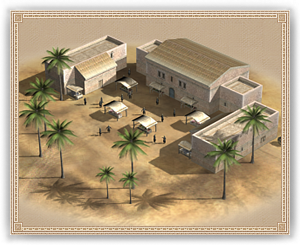 Merchants are agents that work for their lord by establishing trade routes between distant foreign resources and their own local markets. Under the guise of private enterprise, merchants are able to move through enemy lands without drawing suspicion or committing a diplomatic transgression. When merchants work together so that they have a monopoly on a particular resource, they will generate extra income for their faction. Opposing merchants can attempt to make a hostile takeover of each other's assets, ending the other's career. Merchant 商人 Merchants are agents that work for their lord by establishing trade routes between distant foreign resources and their own local markets. Under the guise of private enterprise, merchants are able to move through enemy lands without drawing suspicion or committing a diplomatic transgression. When merchants work together so that they have a monopoly on a particular resource, they will generate extra income for their faction. Opposing merchants can attempt to make a hostile takeover of each other's assets, ending the other's career.